Since 2004, seven students from the Perry Service Learning (PSL) have traveled to Cincinnati early in the school year to attend the Mayerson High School Service Learning Workshop hosted at the University of Cincinnati. This workshop attracts students and teachers involved in service learning from over 50 high schools for a day of sharing best practices. While in Cincinnati, students stay at St. Vincent De Paul in the West End neighborhood and serve at the Drop Inn Center and St. Francis Seraph Soup Kitchen in nearby Over-the-Rhine. 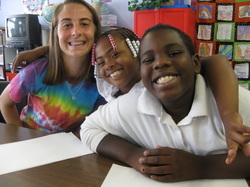 Students also volunteer at Winton Place Youth Center, an after school program serving students who live in Cincinnati. Since 2009, students in the Perry Service Learning (PSL) class have kicked off the school year at The Salvation Army in Painesville. Each class spends a full day at the Salvation Army, participating in poverty simulations, performing service, and attending a volunteer fair. The poverty simulations are designed to prepare students for issues they will examine during our unit on poverty and homelessness. 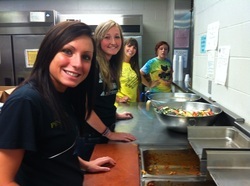 In the afternoon, students prepare and serve lunch at the Salvation Army soup kitchen. The day concludes with a volunteer fair during which students can meet volunteer directors from agencies they will have the opportunity to serve at through the PSL program. Click here to see the 2012 Salvation Army field trip schedule. In 2012, PSL students took two field trips designed to enhance our classroom study of education reform. Two separate groups of seven PSL students traveled to St. Ignatius High School and Breakthrough Charter Schools to study the impact of school culture on student performance. 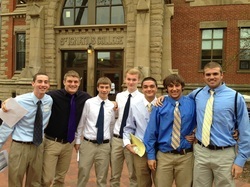 The PSL students who traveled to St. Ignatius were paired up with seniors and shadowed them for their entire school day. The PSL students who visited Breakthrough Charter Schools met with the communications director and toured Citizens Academy, E-Prep, Village Prep, and the Intergenerational School. In both cases students observed how the social climate, intellectual climate, rules/policies, traditions/routines, work habits, and relationships between students, parents, and staff impacted student outcomes. 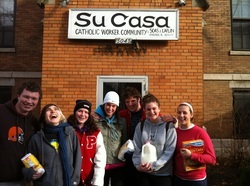 Since 2004, a group of PSL students have traveled to Chicago, Illinois each December to live and serve at Su Casa, a homeless shelter for domestic violence survivors on the city’s south side. This unique trip affords students the opportunity to live and work in the shelter for 3 nights/4 days. Students perform a variety of tasks such as preparing and serving meals, winterizing the building, painting rooms, shoveling snow, raking leaves, sorting donated clothes, distributing food at a neighborhood pantry, and providing care to children staying at the shelter. By the end of the four day experience, students will accumulate over twenty hours of service. For more information on this experience visit Su Casa's web page, then click "Support Us" and scroll down to "Plunge." For additional information and to sign up, please click here. During our unit on immigration reform, seven PSL students embark on a one day field trip in Northeast Ohio to examine the impact of immigrants on our community in the past and in the present. The trip begins with a tour of the Cleveland Cultural Gardens and Cleveland Museum of Art. Next, students meet with individuals representing government, law enforcement, schools, nursery owners, and social service organizations. Ultimately, students learn about immigration from multiple local perspectives so that they can better understand the debate over immigration reform taking place at the national level. Click here to see the 2013 immigration plunge schedule. During our unit on topics in special education, seven PSL students take a one day splunge to examine the issues of inclusion and employability of people with special needs in the past and present. The trip begins with a tour of the Lake County Historical Society Museum to learn about the practice of institutionalization in the 20th century. Next, students will explore how communities are attempting to create more inclusive environments today. Despite these efforts, unemployment rates for people with special needs remain alarmingly high. Students will meet community leaders who are working to end discrimination in the workplace against people with disabilities. Click here to see the 2013 topics in special education plunge schedule. Since 2009, the PSL classes have taken a field trip to the Rock and Roll Hall of Fame to participate in a program titled “Fight the Power: Music as a Force for Social Change.” This trip coincides with our study of the influence that music and literature have had on domestic policy in the United States and will enable students to see how people have used diverse forms of music to challenge their audiences to work for social change. 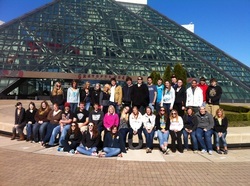 The Rock and Roll Hall of Fame offers this program at no cost to students in Northeast Ohio. For more information on the Rock & Roll Hall of Fame's "Fight the Power" program, click here.